(Available: Bridesmaid, Maid of Honour, Chief Bridesmaid, Flower Girl. 2) Bridesmaid, Maid of Honour, Chief Bridesmaid or Flower Girl. Silver Charms: Star, Heart or Flower. ♥ Will you be my. ?. Wish Bracelet ♥. Size approx 21cm x 15cm (A5) i ncludes quality V flap envelope. Your card will be printed on quality linen finish card. Details of who it's from. And can be personalised with. My Sister & Bridesmaid. For being my Sister, Bridesmaid & Best Friend. A sister's love is precious. Each item is unique, orders will be similar in colour and design, but never identical. Fully personalised with your own details. 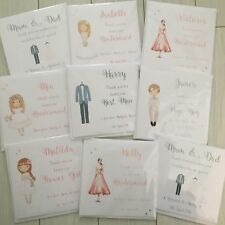 Each card is fully personalised with your individual details. Gorgeous square cards on white or ivory card. CHOICE OF WHITE OR IVORY CARD. Your wording will be embedded directly into the plaque. The plaque will be made from mdf wood. We could say the ink is "in" the wood. ie Emily, love Amy & Paul, 07.01.2017. There is love, creativity and uniqueness. Personalised Plaque - Team Bride Gift. and can be personalised with. When I'm walking down the aisle a very happy bride. You've been the best Sister you could be. And I'm so blessed that I can say I have a Sister like you. Personalised Plaque - Team Bride Gift. and can be personalised with. No matter good or bad. Each item is unique, orders will be similar in colour and design, but never identical. as what you enter here will be exactly what appears on the product. Personalised Wedding "Will You Be My." Card. Fully personalised with your own details. Each card is fully personalised with your individual details. Dress available in 10 colours. 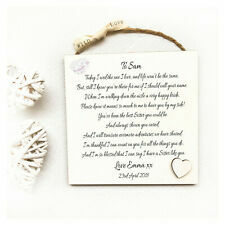 Choose from Gorgeous square cards on white or ivory textured card. Fully personalised with your own details. Each card is fully personalised with your individual details. Ribbon available in any colour mix. RIBBON COLOUR/COLOURS. CHOICE OF WHITE OR IVORY CARD. 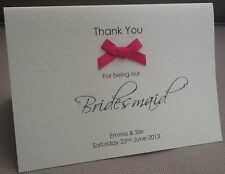 Gorgeous square cards on white or ivory card. Wedding Date. Handmade using good quality textured card. Elegant card decorated with ribbon, diamante gems, and glitter on the bride's veil. Ribbon Colour. Best Man, Usher, Groomsman, father of the Bride/Groom etc. Bridesmaid, Maid of Honour, Flower Girl, Mother of the Bride/Groom, Mum & Dad etc. Printed on high quality 300gsm white card, with quality 100gsm diamond flap envelope. HANDMADE on Good Quality Textured Card. Featuring a bridesmaid dress decorated with feathers, diamantes and ribbon. A lovely card to treasure. Colour(s) of dress (most colours available). PRINTED ON 300gsm WHITE LINEN EFFECT CARD, COMPLETE WITH WHITE GIFT ENVELOPE. WEDDING HAIRDRESSER. WEDDING FLORIST. IMPORTANT NOTICE . MAKE UP ARTIST. This beautiful 'To our Special Bridesmaid' wedding card with a cute verse on the front of the card is accented with etched and raised fluted silver foil.